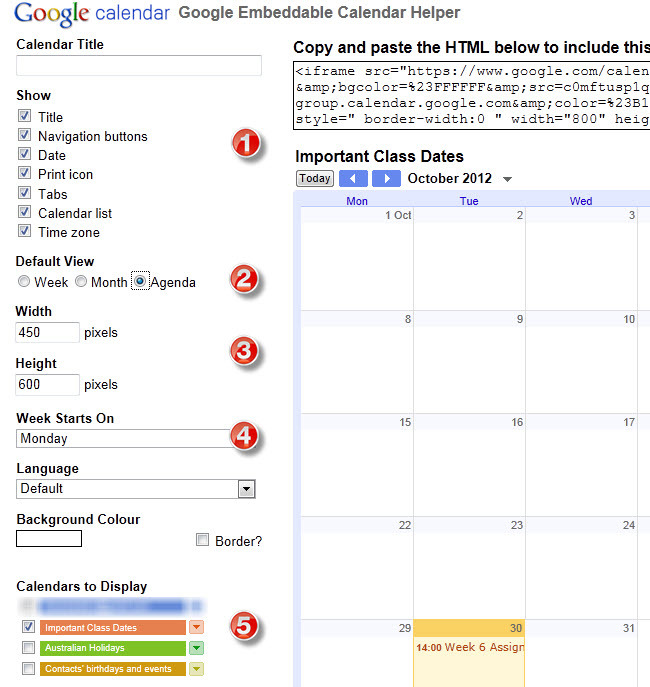 The best option for adding a calendar to your blog is to using a Google Calendar. make public so others can subscribe to or view. For example, you can create a personal calendar which you keep private, not viewable by others, and a school calendar that you share with parents, family and students. The Calendar widget in Appearance > Widgets is not an events calendar; it creates a calendar in your sidebar with clickable links to your blogs posts for particular dates. Dates that appear in bold type indicate dates you’ve posted. It doesn’t let you setup a calendar of events. It’s only use is to display links to your posts by date. 1. Create a Gmail account (if you don’t have one). 2. Go to Google Calendar and sign in with your Google Account. 3. Click on Create a new Calendar under drop down menu next to My Calendar. 4. Add Calendar Name (1), Description (2), select Make this Calendar public (3) and click Create Calendar (4). 5. When you see “Warning: Making your calendar public will make all events visible to the world, including via Google Search. Are you sure? ” you need to click Yes otherwise your students and parents won’t be able to view the calendar. 6. If you expand the My Calendar menu you will now see your new calendar has been created. 7. Now just click on Create to add an event to your Calendar. 8. Add event title (1), date and time (2), Where (3), select your calendar (4) from the Calendar drop down menu (in our example it is Important Class dates), add a description and click Save (5). 9. Your event will now be added to your Calendar. You repeat this process to add events to your Calendar. 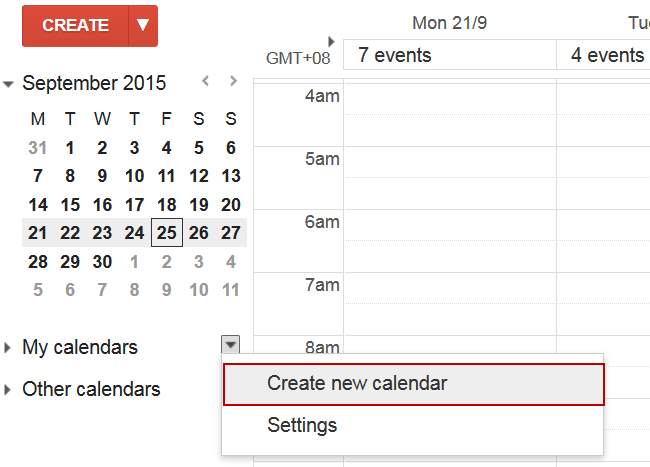 Remember you can add and delete events from your Google Calendar at any time. All you need to do is log into your Google Calendar and update your events. 10. You edit an event by clicking on the name of the event. This opens the event in Edit mode where you just update the details then click Save. A text widget in your blog sidebar. 1. Complete write your page including adding title, any text and images. 2. Click on Save Draft, previewed your page and make all necessary edits. 3. 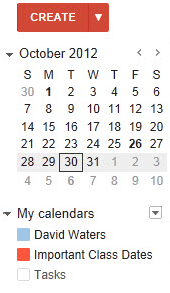 Go to Calendar Settings in your Google Calendar. 4. 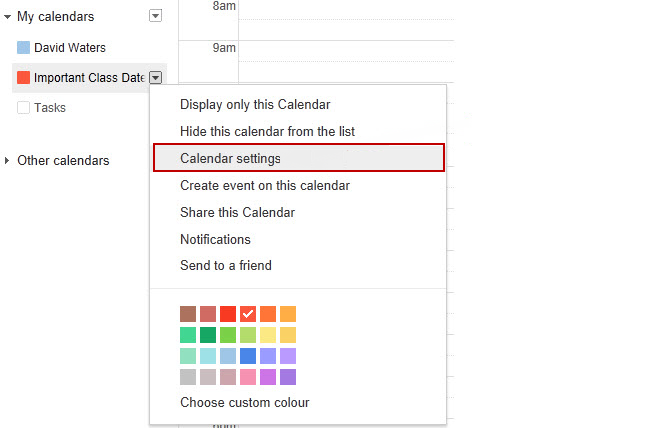 Click on Customise the color, size and other options next to Embed this Calendar. 5. Choose which options you want to Show on your calendar (1), the default view (2), adjust the width and height (3), select the Week Starts on day(4). and which calendars (5) to display when embedded. Maximum width for pages on most themes is 450 pixels wide. 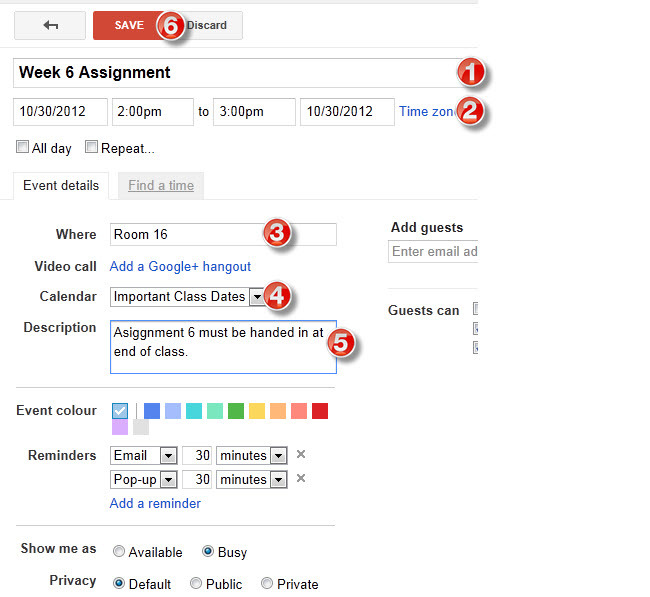 Agenda is often used as default view as it displays the event details nicely when embedded. TIP – place cursor in HTML box, hold Ctrl and then press A to select all the HTML code then press Ctrl and C to copy. 7. Place your cursor in the post where you want you it to be embedded and click on Add Media button. 8. Click on Insert Embed Code. 9. Paste the embed code into the Insert Embed code box and click Insert into post. 10. 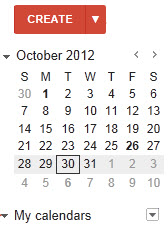 When you view the page on your blog you will now see your Calendar embedded. 12. If your readers see the message you don’t have permission to view this calendar it means you didn’t make your calendar public and you need to change your Calendar Settings to Public by going to the Share this Calendar tab.